We are so proud of our boy. He's doing so well in school - both in academics and in extra-curricular activities. He has also represented his school in inter-school events. On February 2011, he'll be competing with other kids from grades 4 to 7 in the 1st Kulturang Pinoy Quiz Whiz at the Department of Education headquarters. He's one of the two 4th graders (the other one's from a different school) who got in the elimination round. I'm not writing this to brag about his achievements. I would just like to share what we did to nurture his intelligence and to place him on top of his class. Months before Rap was born, I gladly quit my job to be a full-time mom. I have been raised by a full-time working mom. I and my siblings were basically left to study by ourselves. I hope you don't get me wrong. I salute all the working moms out there who can perfectly juggle both career and mommy responsibilities. I have just been fortunate to have the option to stay at home and care for my child. Staying at home gave me lots of time to be with my boy. I read to him even when he was barely a year old and made him watch educational videos. He spoke his first word way before he even learned how to walk on his own. He did not even baby talk, he was just bulol with his R's and L's until he was in Kindergarten. 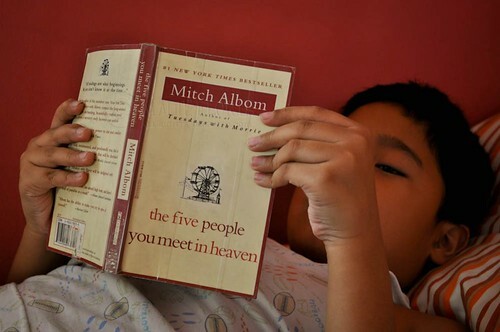 He's now into Mitch Albom after finishing the Harry Potter series. Rap starting reading at 2 and 1/2 years. Since I wasn't working, I thought of homeschooling him. I chanced upon www.letteroftheweek.com and I designed a program for him using the lessons in this site as guide. I manually wrote and drew worksheets for him because we didn't have a printer yet. Simultaneous to that, I also taught him Math concepts, Filipino, and Writing. After finishing the 32-week curriculum (26 letters + 5 long vowel sounds), we went on to memorizing flags and capitals of the different countries of the world. We went to trips in the village's playground and clubhouse for our P.E. days. We also had field trips with Daddy. As some of you may now know, it's this first-hand teaching experience with my son that inspired me to pursue my graduate studies in Education. I became a pre-school teacher the same year Rap turned 4 and went to study in the big school. Even so, I still continued to aid him in his studies by making test reviewers for him and helping him out with his school homeworks and projects. Aside from training him well in academics, we also invested in developing his talents in sports and the arts. At age six, he was part of his school's varsity football team. Then, as he grew older, his interest moved on to swimming and Taekwondo. We also enrolled him in voice and theater lessons. He's now using the vocal skills he acquired as part of his school's grade school choir. Moreover, we nurture his physical and mental development by providing him with healthy food and vitamin supplements. Rap is still a picky eater so I still have him drink milk and take his vitamins daily to supply the nutrients that he may not be getting from his favorite foods. We also have him enjoy sufficient rest everyday. In the past decade of being a mommy and a teacher, I have come to a conclusion that all kids are smart. However, not every kid reaches his full potential to be top of the class unless we parents supply them with what they need to succeed. To expand, exceed, and excel in life, a kid should not only be studying in a good school but should also have parents who support him every step of the way.